The Spontaneous Prose Store | Your one-stop shop for pocket profundities. ~ Your one-stop shop for pocket profundities. Kaile H. Glick is an aspiring librarian, infamous woman of letters, and all-around stand-up guy. 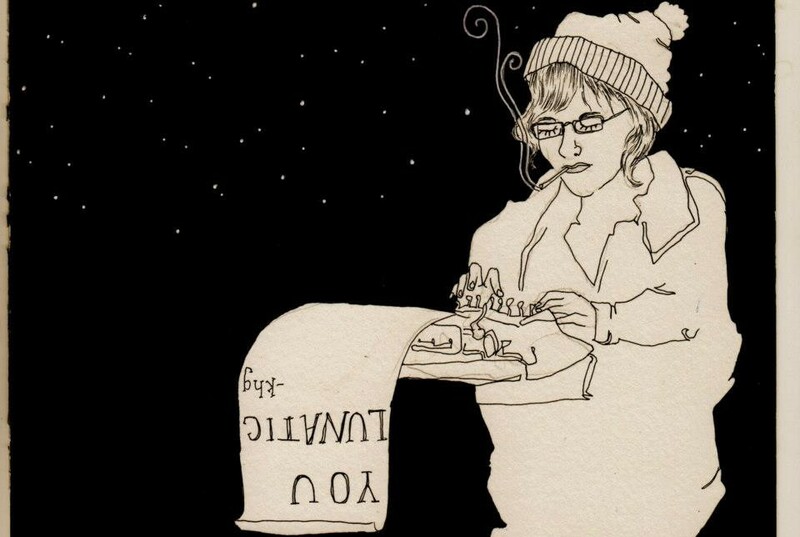 As the Proprietor of The Spontaneous Prose Store she has dispensed her custom made prose-poetry to innumerable pedestrians and party-goers around the world. Every piece of prose is built according to the customer’s unique specifications — before their very eyes. The result comes type-written on a handy, stick-able sticker. Ms. Glick’s poems have appeared in Forum, 16th & Mission Review, Broken Pencil Magazine and Made in Shoreditch. She has been interviewed on CBC radio and Bill Bradley’s American Voices on Sirius XM Radio. She recently published the Spontaneous Prose Anthology Vol. 1 (Holy Mess! Press), a collection of illustrated prose. She is currently working on the second Anthology, an account of her misadventures as a poet for hire. well way to go getting this website up and running! Your header is sweet, and I love seeing the Spontaneous Prose Store in the photo because it’s such a pretty motif. I’m a writer from Vancouver who also does performance art. I think you’re awesome. I’m in Toronto for two weeks and I have to fulfill an assignment for a Vancouver magazine; I was hoping to do a profile on you. You sound amazing! I’d love to write an article about you and your work for Eject magazine. Please let me know if you’re interested for an interview and keep up the good work! It was so nice I would love it if you could write me another piece. Your prosed up FedEx label is pride of place in a frame and I would love another piece to accompany it! Please get in touch it would be fantastic to hear from you. i met you outside a jazz fest show at the horseshoe a few weeks ago with my buddhist and accountant friends. your piece – ‘nancy balogis’ – rests happily on my dresser and is a nice little does of strange pleasantness whenever it catches my eye. i’d like some more spontaneous prose for your store. where are you posting up next?! Enter your email address to follow this blog. Sometimes I say stuff.